Homeland Security Secretary Kirstjen Nielsen at a Senate Judiciary Committee hearing in January. "Illegal aliens should not get just different rights because they happen to be illegal aliens," she added. In a wide-ranging interview with NPR's John Burnett airing on All Things Considered, Nielsen stood by the policy announced earlier this week as well as the administration's broader crackdown on illegal immigration, saying her department is merely following the law. She says if the public wants different immigration laws, then it is up to Congress to change them — and that the fierce criticism directed at her department is unwarranted. "The pushback in terms of us enforcing the law is inappropriate and unacceptable. If somebody wants a different law, they should go to Congress and get a different law passed. But we took an oath and we will uphold the laws of this country," she said. 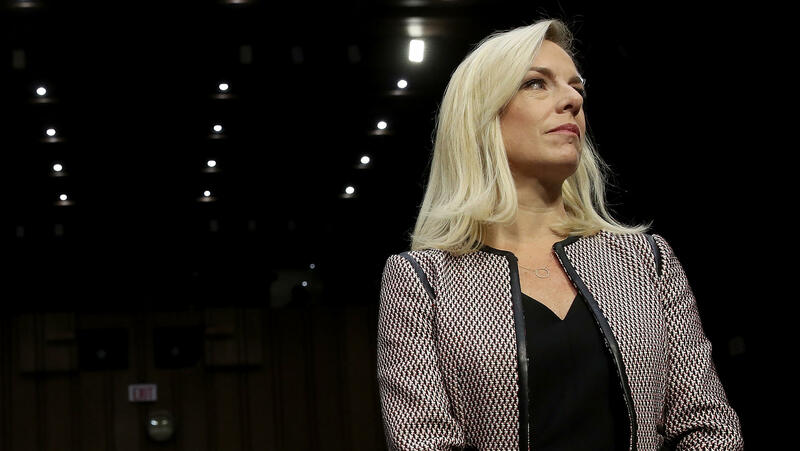 Nielsen's five-month tenure so far as homeland security secretary has already been consequential — and controversial. Attorney General Jeff Sessions announced the zero tolerance policy earlier this week, and on Tuesday Nielsen appeared on Capitol Hill where she faced questions from skeptical lawmakers. Under the policy, DHS will begin referring for prosecution anyone it catches trying to enter the United States unlawfully. Immigrant advocates criticized the announcement, saying it's cruel to separate children from their parents. "The law says if you cross between the ports of entry you are entering without inspection and that is a crime," Nielsen said. "First time is misdemeanor." "After that it's a felony," she added, "and then it goes on from there. So that hasn't changed; that's the underlying law. Our policy has not changed and that is if you break the law we will refer you for prosecution." Nielsen clarified that the policy is targeting families who try to illegally cross away from a port of entry. Families who present themselves at a ports of entry can ask for asylum. They will get a "credible fear" interview, and they will not be prosecuted, she said. The administration had been separating families for months before the recent policy. Officials said they only did so in certain circumstances, such as when a mother couldn't prove parentage. In one case in November, a woman and her 6-year-old daughter fleeing the Democratic Republic of Congo showed up at the Tijuana/San Diego port of entry and asked for asylum. Federal agents separated them. The little girl was sent to Chicago where she stayed in a government-contracted youth shelter. The mother was locked up in detention for four months in San Diego, Calif. They were finally reunited after a lawsuit and a public outcry. The secretary was asked if her department should have handled the case differently. "I think we can always do better. We're learning a lot from it," she said. "As you know it's an active lawsuit. So unfortunately I can't get into all the things we're doing to improve the system. But absolutely, it's not our intent to separate people one day longer than is necessary to prove that there is in fact a custodial relationship." Also on her watch, DHS has canceled temporary protected status for immigrants from a number of countries, including El Salvador, Honduras and Nepal. The program is a form of humanitarian relief offered to immigrants of countries struggling with the aftermath of war or natural disasters. The Washington Post reported Tuesday that U.S. diplomats in those countries had cabled the State Department, urging against revoking TPS for fear that the countries could not safely reabsorb tens of thousands of returning nationals. Nielsen again insisted that she is only following the law. "I was required to take that action by the law, pure and simple," said Nielsen. "The statute is very clear. If the conditions that originated from the designating event no longer exist, the statute says the secretary shall terminate. To pretend that conditions continue to exist from a hurricane 20 years ago is a fiction." Nielsen was referring to a 1998 hurricane that struck Honduras, killing thousands and creating a migrant flow to the States. Administration officials insist that conditions in Honduras have improved. As the Trump administration ends TPS for those countries, hundreds of thousands of people will lose legal status. Nielsen, 45, previously served as chief of staff for Gen. John Kelly when he was homeland security secretary, then followed him to the White House when he became President Trump's chief of staff and continued as his deputy. Trump nominated her to succeed Kelly at homeland security late last year. She was confirmed in December. Prior to that, she served in George W. Bush's administration as special assistant to the president and sat on the White House Homeland Security Council. The Department of Homeland Security is defending the Trump administration's tough stance on immigration. Kirstjen Nielsen says her agency is simply enforcing laws already on the books, and she is responding to critics who say the administration's actions are harsh and mean-spirited. KIRSTJEN NIELSEN: The pushback in terms of us enforcing the law is inappropriate and unacceptable. If somebody wants a different law, they should go to Congress and get a different law passed. But we took an oath, and we will uphold the laws of this country. KELLY: Secretary Nielsen presides over a massive agency with a massive mandate, including preventing terrorism, responding to natural disasters and enforcing immigration laws. Well, NPR's John Burnett, who covers immigration, sat down for an interview today with Secretary Nielsen. And he is now here in our studio in Washington to tell us about it. Hey there, John. JOHN BURNETT, BYLINE: Hi, Mary Louise. KELLY: So this took place at her office at the Department of Homeland Security. Set the scene for us here. BURNETT: Right. It was in a conference room at a table. There was a couple of press people there, and she sat and took my questions. I only had 15 minutes, and she very forcefully answered all of them. KELLY: Give us the briefest portrait of who she is because for a cabinet secretary, Kirstjen Nielsen is not so familiar to a lot of Americans. BURNETT: She has been in the shadow, in some ways, of who she considered her mentor, General John Kelly. Now, she's a 45-year-old lawyer, a national security expert who served in the George W. Bush administration and then was a top aide to Kelly both when he was head of Homeland Security and then when he went to the White House as chief of staff. And so she was confirmed as DHS secretary in her own right late last year. KELLY: Now, she has been in the news just this week because of this announcement - this controversial announcement that immigration agents will separate families who crossed the border illegally, even families who are crossing the border to try to seek asylum. BURNETT: Right, but she wanted to clarify - and I think this was important - that families who present themselves at ports of entry can ask for asylum. They'll receive a credible fair interview, and they will not necessarily be arrested on the spot and separated. It's the families that cross the border illegally - that maybe take a raft across the Rio Grande. They'll be arrested, prosecuted, and they'll separate the parents from the children. KELLY: And did you ask her, is this meant to be a deterrent specifically for families leaving Central America? BURNETT: Well, I even asked her about a quote that I had read in The New Yorker magazine that taking children from their parents is a form of state terror. NIELSEN: What it's meant to do is do our jobs. I mean, that would be like saying that when people commit crimes in this country and they're put in jail and separated from their family, that somehow that's terror. In the United States, we call that law enforcement. We call that protecting our communities and our children. That's what we're doing. BURNETT: But separating families isn't - it's an extreme measure. NIELSEN: Well, it's not. Again, we do it every day in every part of the country. If you have a family and you commit a crime, the police do not not put you in jail because you have a family. They prosecute you, and they incarcerate you. Illegal aliens should not get just different rights because they happen to be illegal aliens. BURNETT: So, Mary Louise, I wanted to put a human face on DHS enforcement policies, and there's this one particular case that's got loads of attention. A woman and her 6-year-old daughter fled the Democratic Republic of Congo and showed up at the Tijuana-San Diego Port of Entry asking for asylum last November. KELLY: Oh, this is the case from last fall, last November. BURNETT: Right. Federal agents separated them. They took the little girl and sent her to Chicago where she stayed in a government-contracted youth shelter. And they locked the mother up in detention for four months in San Diego. They were finally reunited after a lawsuit and a big public outcry. And I asked Secretary Nielsen about that case. Do you wish that you all had handled that case differently? NIELSEN: I think we can always do better. We're learning a lot from it. As you know, it's an active lawsuit, so unfortunately I can't get into all the things we're doing to improve the system. But absolutely, it's not our intent to separate people one day longer than is necessary to prove that there is in fact a custodial relationship. KELLY: Would she get, John, at all into what DHS is going to do under her leadership? Is the plan here to arrest everybody in the country who's unauthorized? That would be - what? - something like 11 million people. BURNETT: Right. I asked her that, and this is what she said. NIELSEN: I don't think anyone would pretend that's possible. So what we are doing is we prioritize. We will deport as many as resources allow. We do that in a structured, targeted way. We go after this from a policy position that we feel it's a threat to the United States and our community. So as you know, we focus on the criminal element, for example, but we do not have the current resources today to deport all 11 million, for example, in the next year. KELLY: John, let me turn you to another item I know is on your list to ask Secretary Nielsen about. This is TPS, temporary protected status. It's been in the news a lot of late. TPS allows immigrants to stay in the U.S. - immigrants from certain countries that maybe have been struck by natural disaster or by war. BURNETT: Right. And so in recent months, DHS has cancelled temporary protected status for some 400,000 immigrants from Central America, the Caribbean, Asia and Africa. Her answer was pretty simple. She said U.S. law required her to take that action. Let's listen. NIELSEN: The statute is very clear. If the conditions that originated from the designating event no longer exist, the statute says the secretary shall terminate. To pretend that conditions continue to exist from a hurricane 20 years ago is a fiction. Does that mean there isn't difficulty in that country - no. Does that mean we shouldn't take care of TPS - no. But does that mean that I have any authority to continue to grant them temporary status? It does not. BURNETT: But there was some discretion. I mean, you could - some of these have gone on, you know, for 15-plus years. But you all decided to draw a line in your tenure. NIELSEN: Yeah, we decided to enforce the law. We don't make immigration law. Congress should pass a law to give permanent status to those who've had temporary protective status. I am not going to bow to political pressure, however, to break the law to do Congress's job. They need to do it. KELLY: It's interesting, John, to hear how the secretary is framing this because she has faced criticism that senior White House officials such as chief of staff John Kelly and senior policy adviser Stephen Miller are driving a hard-line agenda at her department. Did you ask her about that pressure on her department? What'd she say? BURNETT: Yep, I asked her directly, is the Homeland Security Department independent from the Trump White House? NIELSEN: Well, it is. We have operational control. So we have the men and women who execute the laws each day. What we do, though, is - this takes a partnership. So one of the roles of the White House is to help coordinate the interagency, and General Kelly and Stephen Miller help us do that. KELLY: So, John, what's your takeaway from having sat down with her and asked her about the criticism her department is coming under from a lot of quarters? BURNETT: Secretary Nielsen is not backing down one inch from this harsh criticism of her agency's enforcement actions. DHS is going to fix what she says is a broken immigration system, and that's exactly what the Trump administration wants her to do. KELLY: John Burnett, thank you. KELLY: John Burnett reporting there on his sit-down interview today with the secretary of Homeland Security, Kirstjen Nielsen. Transcript provided by NPR, Copyright NPR.